"Sure, confident, lock kiya jaaye?" These words in Amitabh Bachchan’s resounding voice will be heard on TV once again with the megastar all set to return with the fourth season of the popular game show "Kaun Banega Crorepati" (KBC). 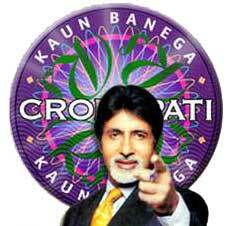 "I am glad to be back with 'Kaun Banega Crorepati'. It is always a great pleasure to be associated with BIG Synergy," Amitabh said at a press conference for the show's official announcement Wednesday. The show will air on Sony TV before the year ends. Based on the British show "Who Wants To Be A Millionaire? ", KBC created history when it was first launched on Star Plus in 2000 with Amitabh as the host. He returned with the second season in 2005, after which superstar Shah Rukh Khan took over the baton in 2007. Now, Big B, as he is popularly known, is back to charm the audience. "The language and the typical words that I used in the second season will be the same. There will be no changes in that regard," Amitabh said. Channel officials, however, said there would be "many changes" in the format and process of the show, details of which would be divulged at a press conference later. Said Ajit Thakur, business head of Sony TV: "The audition process will be more elaborate and this time the first 10 contestants will be chosen through an on-ground event where Amitabh-ji will engage in a video conference and ask questions." The channel is confident that the audience will come back to see the show because they have "retained the three pillars of the show". "The three pillars of 'KBC' are intact. The money - Rs.1 crore - is still a life changing amount for many common people, the knowledge on the show is still useful and of course, Amitabh Bachchan and his presence will always draw audiences. That's why people will still see 'KBC'," said Thakur. The phone lines for the new season will open in August.